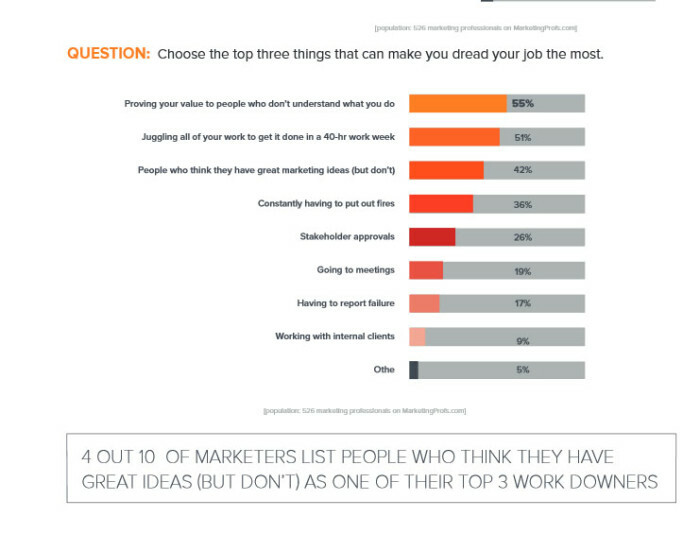 Does it come as any surprise that marketers are stressed in their jobs? With new emerging platforms and technology being thrown in with the old, these folks are always on the run to acquire new knowledge. A recent study done by Workfront, a provider of marketing work management solutions found the main causes of for marketers come from too few team members and too much work. 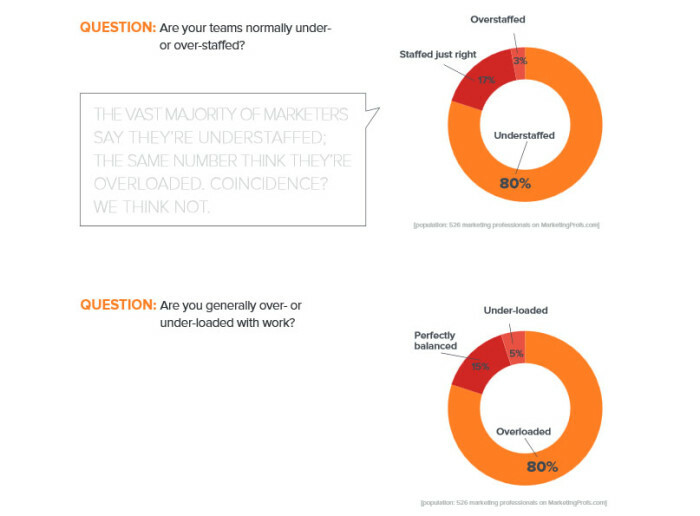 Nearly 80% of marketers surveyed say that they’re understaffed and overloaded. 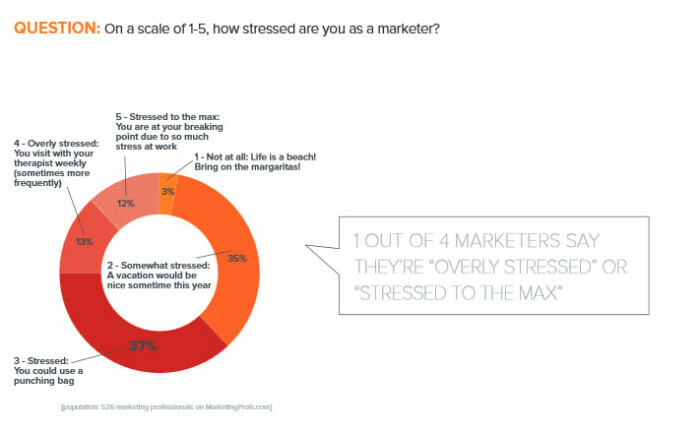 Meanwhile an alarming number of marketers are crossing the threshold for acceptable stress, with almost 25% “overly stressed” or “stressed to the max”. 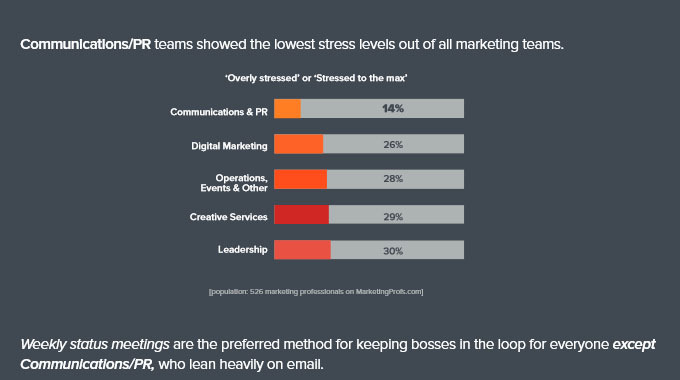 Surprisingly enough, the study also states that communications/PR teams showed the lowest stress levels out of all marketing teams. This was followed by digital marketing teams and operations and events teams. 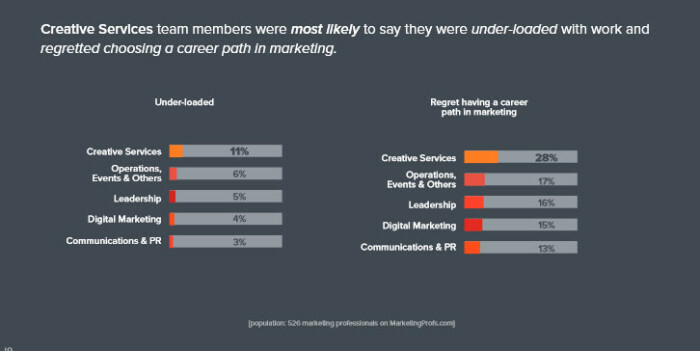 Meanwhile, creative services team members were most likely to say they were under-loaded with work and regretted choosing a career path in marketing. Overall, approximately 16% of the interviewees regret choosing a career in Marketing. So what exactly is causing the stress? One main reason contributing to the stress is bad work processes that are hurting results. For instance, for 36% of marketers, delayed approvals cause work to be completed late twice a week or more. Meanwhile, constantly proving your value to those who do not clearly understand what you do is also another reason for marketers to dread work. This survey was conducted on the MarketingProfs.com website from April to May 2015 among 526 participants, who were users of the MarketingProfs.com website and marketing professionals, by MarketingProfs on behalf of Workfront.